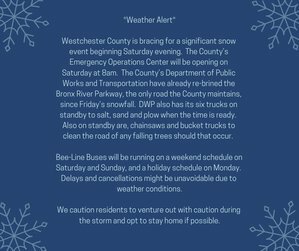 Westchester County is bracing for a significant snow event beginning Saturday evening. The County’s Emergency Operations Center will be opening on Saturday at 8am. The County’s Department of Public Works and Transportation have already re-brined the Bronx River Parkway, the only road the County maintains, since Friday’s snowfall. DPW/T also has its six trucks on standby to salt, sand and plow when the time is ready. Also on standby are chainsaws and bucket trucks to clean the road of any falling trees should that occur. Bee-Line Buses will be running on a weekend schedule on Saturday and Sunday, and a holiday schedule on Monday. Delays and cancellations might be unavoidable due to weather conditions. We caution residents to venture out with caution during the storm and opt to stay home if possible.